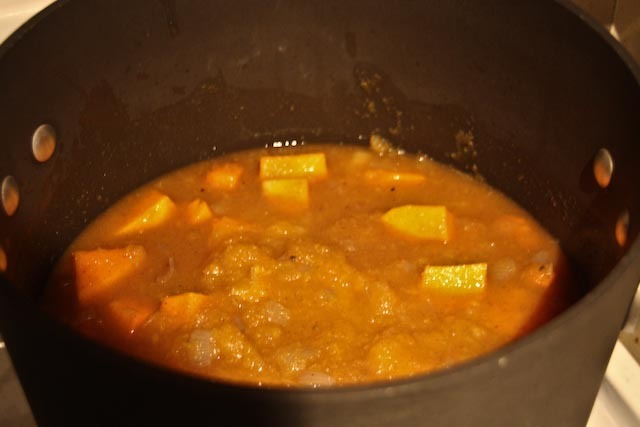 It was cold this weekend (I know, I know, 50°F isn’t really cold), so I decided to make a warming winter squash soup out of pumpkin puree and a leftover half of butternut squash. It was a perfect for lunch on a lazy fall weekend. This soup is based on a recipe for winter squash soup by Ina Garten of Barefoot Contessa fame (her recipe can be found here). I added lots and lots of delicious spices to my version in order to add a little pizazz. 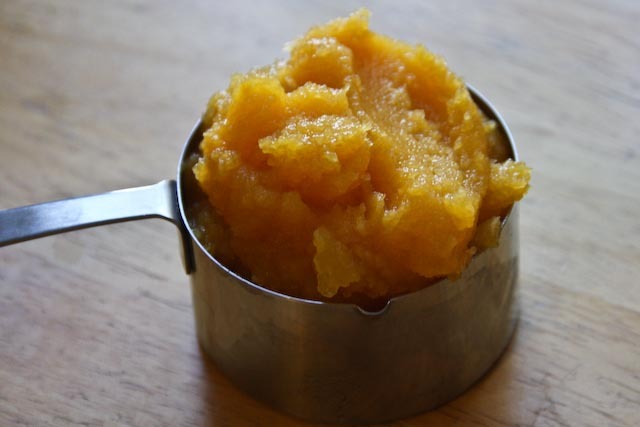 I also chose to use homemade pumpkin puree instead of canned puree, and made the squash ratio about half butternut and half pumpkin in order to get more of that nutty pumpkin flavor. 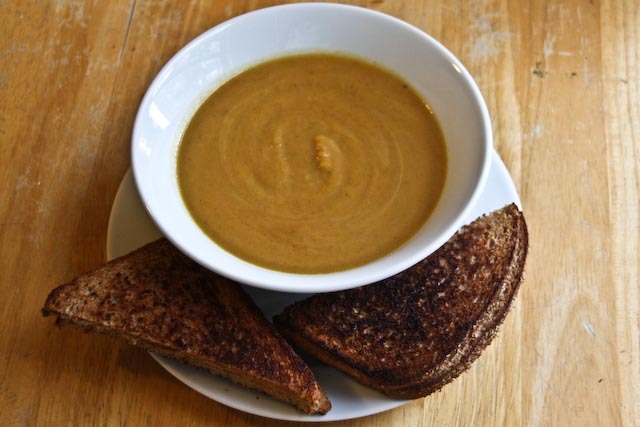 You could easily make this soup using less pumpkin and more butternut squash, if you so desired. The best thing about this soup is that you can make it in about half an hour, plus it keeps for several days in the fridge! And bonus, it’s really healthy and low in calories! OK, there’s at least 3 awesome things about this soup. The soup cooks just until the butternut squash chunks are nice and tender. I used a blender to mix everything together and make a nice and smooth soup. Half and half added into the soup makes it oh so creamy. The first day we ate the soup with grilled cheese sandwiches. Yum! 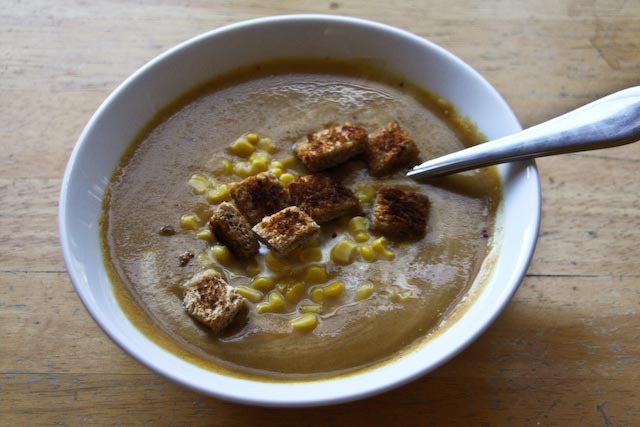 The second day, I topped it with a bit of sour cream, corn kernels, and some homemade garlic croutons. Also Yum! Disclaimer: This soup is very, very filling, so beware! If you are serving it as a starter course for a meal, my advice is to use quite small portions to avoid filling up on soup before the main course! In large pot, heat butter over medium heat. 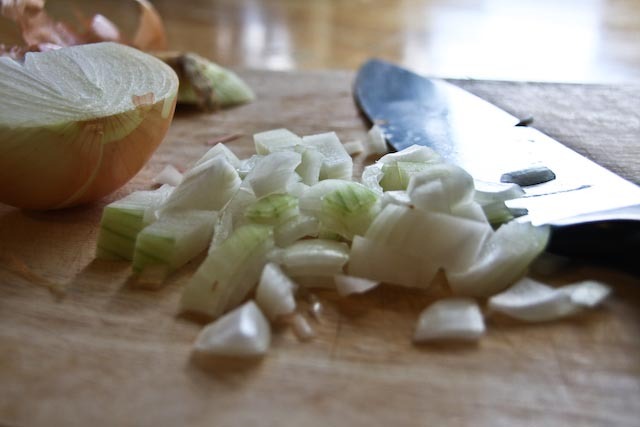 Add chopped onions and cook for a few minutes until tender. 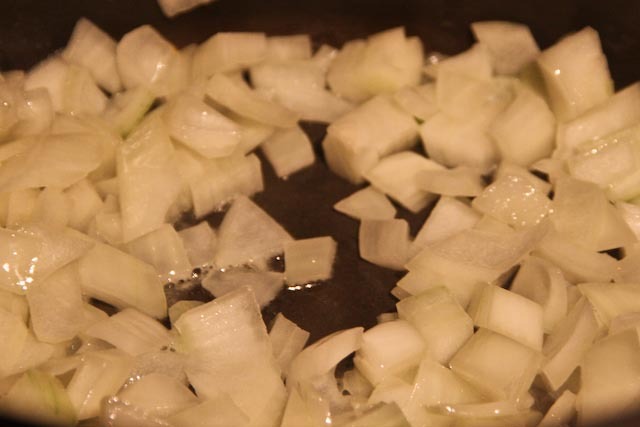 Add salt and pepper, cinnamon, ginger, cloves, and allspice, and stir to coat onions. Add butternut squash and pumpkin puree and stir. Cover squash and onions with approximately 4 cups of broth. Stir well. 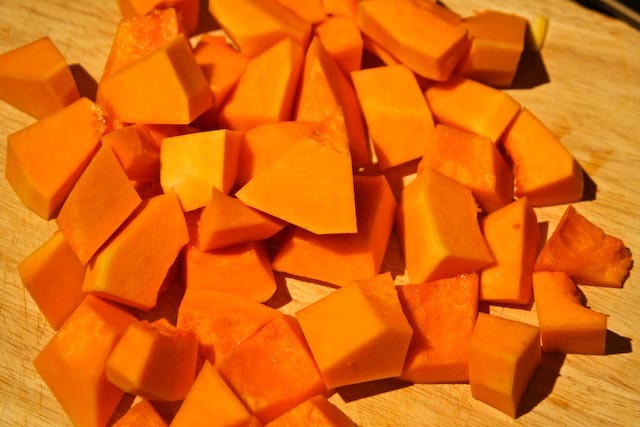 Cover, reduce heat to low, and cook – stirring often – for about 25 minutes or until the butternut squash is tender. Remove from heat and allow soup to cool slightly, about 10 minutes. 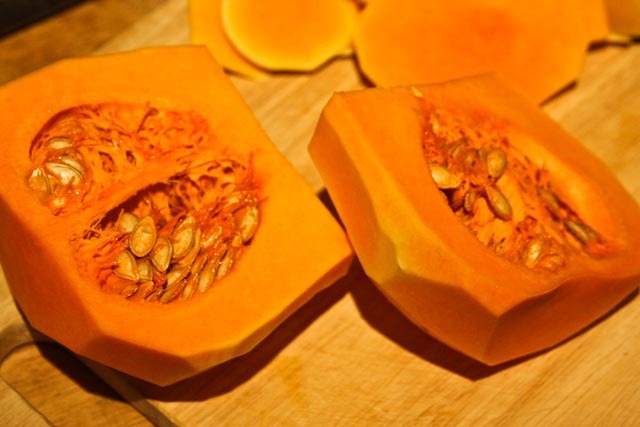 Blend soup in batches in a blender or food processor – or use an immersion blender right inside the pot – in order to mix in the squash and onions and give the soup a smooth texture. 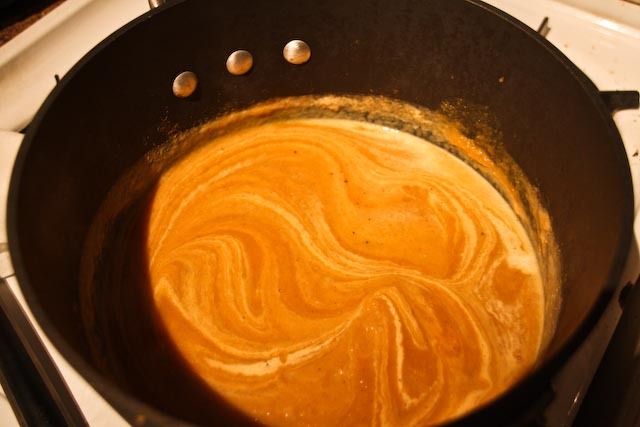 If the soup is too thick, add a little extra broth or water, and mix well. Return the soup to the pot and add half and half. Serve warm (you may need to reheat the soup prior to serving).